Description of "Common and Not So Common Sense"
So, Is Investing Complex? Is it something best left to specialists? Does a regular individual investor have no chance? Why do normal individual investors repeatedly burn their fingers, and money, when it comes to investing? Why are most individual investors usually scared and pessimistic, and always at a loss to determine what to do, when it comes to money and making it grow? Why is it that most investors feel ‘I don’t understand this’ and stay away or leave investing to so-called experts? If you have ever wondered if there is a simple way that will help you stop taking those dubious investing decisions, then you need this book. Taking inspiration from the wisdom, writings and methods of Benjamin Graham, Warren Buffett, Philip Fisher and other legends of investing, the author Ranjit Kulkarni unravels the framework, temperament and wisdom that a regular individual investor can practically attempt to follow over a lifetime of successful investing. 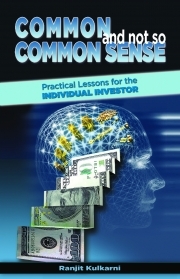 Balanced and prudent, and filled with excerpts to learn from, ‘Common and Not So Common Sense: Practical Lessons for the Individual Investor’ is essential reading for individual investors in their quest for reaching financial independence, and in turn, a more fulfilling life. Ranjit Kulkarni, an MBA from IIM Lucknow, works in the IT and Management Consulting Industry. This book is a result of his passion for financial independence and investing, and an urge to simplify it for the regular individual investor. He lives in Bangalore with his wife and son, and is reachable at http://www.ranjitkulkarni.com where he writes regularly on investing and life. Reviews of "Common and Not So Common Sense"